Alone young man sitting in the rubber boat and fishing at the lake. 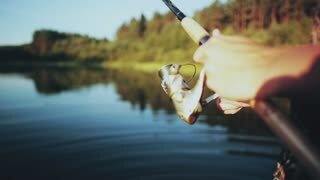 Male holds the fishing rod, catches the biting fish. Close-up view of male hands holding the fishing rod with spinning reel. Young man catching the fish alone. 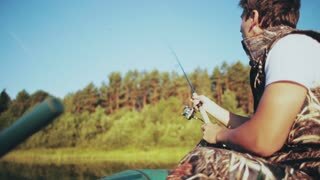 Young man catching fish in the rubber boat at the lake. 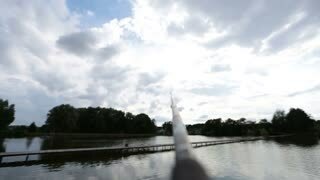 Male throws a fishing rod into the water and twists the reel. Alone young man sitting in the rubber boat and fishing at the lake. 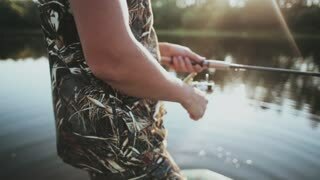 Male holds the fishing rod and twists spinning reel. 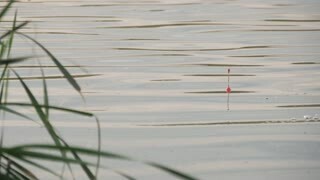 A float for fishing rods in the water while fishing. 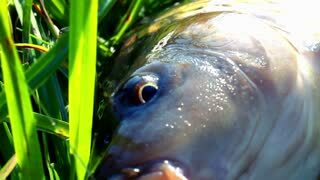 A float in the water signals that the fish is biting. Float on the waves close up.